How does Meningitis Cause Back Pain? Meningitis can cause a number of symptoms and complications that vary from case to case. Early symptoms of the disease may also mimic mild health condition such as flu (influenza). How about back pain? This symptom can be attributed by many factors and conditions, from mild to serious. One of them is meningitis. It is swelling of the membranes around the central nervous system (brain and spinal cord). There are different types of the disease, but the main ones are caused by viral infections. Bacterial and fungal infections are other causes. Many times, meningitis that occurs due to viral infection is mild. Typically, it will clear up more easily and not leave lingering effects. Hospitalization is usually not required. Home treatments are often enough to treat and relieve the infection. The good news, most cases of the disease is viral meningitis. Nevertheless, the symptoms of the disease can be severe enough to interfere with your daily life. What makes it dangerous is when it’s caused by bacterial infection. Bacterial meningitis can cause permanent damage or even a death. That’s why, indentifying the underlying cause of the disease is so important. Bacteria can travel through the circulation (bloodstream) and go to the brain & spinal cord. And then this may lead to meningitis. In some cases, bacteria can also directly invade the membranes covering the brain and spinal cord. This may be caused by skull fractures, sinus infection, or after surgeries (rare). In rare cases, the disease is caused by fungal infection. For example, cryptococcal meningitis (caused by fungus called Cryptococcus Neoformans) is a common form of the disease in people with compromised immune system such as HIV /AIDs. It is usually not contagious, but it can be life-threatening if not treated immediately. Noninfectious factors may also lead to the disease. These include drug allergies, chemical reactions, sarcoidosis (inflammatory disease), or particular cancers. Based on how long the disease lasts, it is divided into the following categories: acute, chronic, and recurrent meningitis. Acute means the disease lasts not more than a month (4 weeks). Chronic, when the disease lasts longer than 4 weeks. And in a few cases it can be recurrent, which means it involves the occurrence of multiple (more than one) acute episodes. Meningitis can affect other systems of the body such as circularly system, skin (integumentary system), muscular and skeletal systems. See also long-term effects of the disease in this section! High temperature (fever). It may come suddenly. More sensitive to light (photophobia). Or in worse scenario, the disease can cause seizures. In a few cases, the disease may lead to jaundice (yellowing of the skin). While the disease often causes fever, sometimes it may also cause a decline in the body temperature (lower-than-normal temperature). They may refuse feeds (poor feeding). Unresponsive, high-pitched crying, sleepiness, or floppy. They may also have a soft spot at the front /top of their skull (bulging fontenell). The early symptoms often strike suddenly, within a few hours – or sometimes they may also appear a few days after the infection. How about back pain? Since meningitis can cause swelling of the membranes covering the spinal cord, it’s quite possible for the disease to cause pain in the back. And the pain may occur in the upper or lower back, depending on where the swelling occurs. Back pain associated with meningitis may come with stiff back and neck. You may find that it’s more difficult to move /turn your back and neck at all. These discomforts can be very bothersome! And it’s going harder to cope with your back pain if the disease causes other problems associated with your skeletal and muscular systems such as muscle weakness, bulging /tight fontanel (in infants), or generalized weakness in some parts of the body! What Part of the Body Does Meningitis Affect? Can Meningitis Make You Blind? 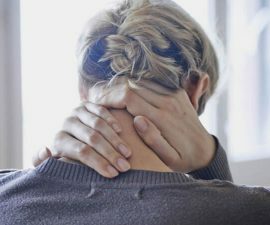 Where Does Your Neck Hurt with Meningitis? Viral meningitis will usually relieve on its own within several weeks. A few lifestyle measures are often helpful enough to cope with (e.g. keeping hydrated, enough bed rest, or (if necessary) over-the-counter pain relievers). However, it’s also important to diagnose the exact kind of virus that causes the inflammation. For instance, it has to do with a herves virus, anti-viral medications are required. See a doctor if the problem lasts longer than expected!